Larry Gilland and Shannon Baumgartner from LGA Studios were honored to attend the “Ground Blessing” ceremony on November 28th of a new duplex project on East Dale Street that we’ve been working on with Pikes Peak Habitat for Humanity. Also present for the ceremony were the families that will be receiving the homes, as well as Mayor John Suthers, PPHFH Executive Director/CEO Kris Medina, Director of Homeowner Services Janet Risley, and others from Pikes Peak Habitat for Humanity. Thank you to Shannon Baumgartner, Dawn Nickels-Streb, Michelle Williams and our entire LGA Studios team for working on this wonderful project for a great organization, we can’t wait for the families to move in to their new homes! Over the past several months, LGA Studios has had the privilege of working on a project for Habitat for Humanity, a true honor for us. Shannon Baumgartner has been an intern with LGA since July and she has been extremely involved on this project. Just in time for the holidays, Shannon put together her take on the behind the scenes process, to the tune of The Twelve Days of Christmas! And she lived to tell about it! Shannon Baumgartner has been an intern with us since this summer and has now come on board as a part-time employee. Welcome Shannon! Earlier this summer, Larry and Mary Gilland had the chance to go on the annual field trip with the Historic Preservation Alliance of Colorado Springs! This year took them to Denver to tour the best Sacred Spaces of the city. Architect and Architectural Historian Chuck Benson led this lively and informative tour, highlighting architectural treasures in our own backyard. We put together a quick summary of this excellent trip and encourage you to check out some of the other offerings and tours the HPA offers throughout the year—it’s a great group dedicated to architectural advocacy and education right here in Colorado Springs! For centuries, sacred spaces have defined cities and nations worldwide, and it’s no different here in our local region. Before Colorado was even a territory, settlers passed through the Rocky Mountains searching for gold, and as soon as camps and settlements began to form, priests and ministers quickly followed to establish churches in the region. These early missions were founded in cabins and shops at the start, eventually gaining congregations and expanding into the larger, grander mosques, churches and cathedrals the HPA was able to tour. We were not able to take a full tour of the Colorado Muslim Society, because the space was being used for Ramadan at the time, but we enjoyed seeing the beautiful brick-clad building, which features a minaret and a central dome. A minaret is a distinctive architectural feature of traditional mosques. These slender towers can vary in shape and style and provide a beautiful focal point. They are traditionally used for the Muslim call to prayer. Prayer halls in mosques are deliberately bare, open spaces. No furniture is needed, as worshippers sit, bow, or kneel on the floor. The mihrab is an ornamental door-shaped indentation that marks the direction of the Qiblah—the direction facing Mecca which Muslims face during prayer. The Colorado Muslim Society was incorporated in 1964, purchasing a building in a residential neighborhood in 1974 to establish the first mosque in Colorado. The current building was constructed over time, expanding to include the mosque which encompasses the main prayer hall for men and women, several classrooms for the Islamic school, a kitchen, offices, and separate ablution areas for men and women. The building offers many services for the local community, and is the only Islamic center in Denver with the appearance of a traditional mosque. Trinity United Methodist Church was founded as the Aurora and Denver City Methodist Episcopal Mission in 1859, and by 1887, the congregation had grown many times over, enough to require a new permanent home. Robert S. Roeschlaub was hired as the architect, assisted by Frederick Albert Hale, and the resulting church is one of the finest examples of “Modern Arts & Crafts Gothic” architecture in the United States. Trinity’s Roosevelt Organ was installed in 1888 and was considered a crown jewel in the West. The impressive 108 pipes visible from the front are only the tip of the iceberg. Behind the facade is a chamber filled with an additional 4,094 pipes, ranging in length from less than one inch to 32 feet, all constructed of varying hardwoods and metals. They were originally powered by a dynamo turned by a water wheel before electricity came to Denver. The stained glass reflects the Arts & Crafts era aesthetic as well, using motifs from nature such as vines and trees to illustrate Christian themes, all presented in a stylized, geometric manner. The majority of the stained glass was designed by Healy and Millet of Chicago, a firm considered an innovator during the Arts & Crafts movement. Larry and Mary were really struck by how beautiful the woodwork was throughout the church, and the way oak was used in lieu of marble or stone. Robert Roeschlaub hand-drew the specifications for each incision for his woodcarver to follow, and the detailed designs include foliage and blossom patterns that stay true to the Arts & Crafts style. Trinity was designed as an auditorium clothed in a Gothic shell, marrying the detailing and aesthetic of Rococo and Gothic styles with the latest technology being used in theaters of the late 19th century. Roeschlaub channeled the principles of the popular Arts & Crafts movement by looking to nature for inspiration and using local materials—most notably the sandstone trim and rhyolite facing that was quarried in Castle Rock—to show off the church’s Colorado roots. Beautiful woodwork and carpentry really take center stage here, in contrast to the use of marble or stone in many other churches. Designing Trinity’s steeple was the pinnacle of Roeschlaub’s career as a church architect. Standing at nearly 184 feet, it was once one of the tallest stone towers in the United States. Because of it’s height, the usual cranes and scaffolding of the day could not be used, so Roeschlaub invented a cage-like mechanism that surrounded the spire, allowing workers and materials to be raised and lowered. Trinity was added to the National Register of Historic Places in 1970. Saint John’s Episcopal Cathedral is the seat of the bishop and is the Cathedral in the Episcopal Diocese of Colorado. Founded by Denver City settlers as Saint John’s Church in the Wilderness in 1860, the original name truly does evoke the Wild West roots of many of the original sacred spaces in the Rocky Mountain region. A fire in 1903 necessitated a new building at the current cathedral block location of 14th and Washington. The church conducted a national competition in 1908 to find the best design for the building, ultimately selecting Tracy & Swartwout, a prominent architectural firm out of New York. Saint John’s is a Gothic Cathedral, featuring tremendous arches and vaults and large expanses of stained glass. Gothic architecture blossomed from Romanesque roots, developing throughout Europe between 1150 and 1400. The style soars to the heavens, evoking a sense of lightness and majesty. The original plan for Saint John’s was deemed too expensive, with elaborate ornamentation and flying buttresses, though the Cathedral still impresses with pointed arches and height. The current building is limited to the nave and a temporary brick chancel, with plans to expand the building in the future into the traditional Cathedral shape of a cross. The Cathedral Basilica of the Immaculate Conception is the cathedral of the Archdiocese of Denver in the Roman Catholic Church. Located in the North Capitol Hill neighborhood of central Denver, the cathedral was designed in the French Gothic style and forms the shape of a Latin cross. The character of the cathedral was influenced by the 13th century Saint Nicholas Collegiate Church of Munster in Moselle, France, which was the birthplace of Bishop Nicholas Chrysostom Matz, who supervised the cathedral construction. The French Gothic building was designed by Leon Coquard of Detroit and completed by Denver architects Aaron Gove and Thomas Walsh in 1911. The foundation is made of granite from Gunnison, Colorado with Indiana limestone making up the exterior walls. The interior is filled with marble from Marble, Colorado, with the finest Carrara marble from Italy used for the altars, pedestals, statues, pulpit, bishop’s throne, and communion rail. The cathedral measures 195 feet in length by 116 feet in width, and a vaulted ceiling rises 68 feet above the slightly sloping nave. Two grand spires soar to 210 feet high to frame the main facade and house the church bells. When opened, the cathedral could accommodate 1,000 worshippers, however, following significant alterations in the aftermath of the Second Vatican Council, the church now accommodates 800. The HPA group also toured the lovely Holy Theophany Orthodox Church in Colorado Springs, located at 2770 N. Chestnut Street. Sacred spaces of all religions are always worthwhile to explore, as you can learn so much about architecture and humanity throughout history. These buildings at once represent beautiful expressions of ancient traditions and symbology while at the same time showcase innovations in construction methods and experimentation with architectural styles, allowing the designers and builders who construct them an opportunity to soar into the heavens. Many of us make a point to tour the great cathedrals and mosques when we travel internationally, but we may not always think to do the same in our own backyard. The summer months are often when we take trips to see beautiful architecture in cities beyond Colorado, but we were happy we had the opportunity to spend time touring the sites right here in the Rocky Mountains this year. It’s always fun to explore your city through architecture, and the HPA provides excellent opportunities to do just that! You can learn more about the Historic Preservation Alliance through their website: http://hpasprings.org/. LGA Studios was honored to receive an award for Best Conceptual Design at the American Institute of Building Design's Annual Meeting in Philadelphia last week! LGA Studios won an ARDA for Best Conceptual Design for this Modern Prairie style home, shown below. This home was designed for a close-knit active family. Between morning hockey practices, dance lessons, and gymnastics, these clients are always on the move, and they needed a home that fit their lifestyle and allowed them to make the most of their time together. LGA Studios was proud to be featured in the Spring issue of SPRINGS Magazine in an article by Cameron Moix all about current home style trends and how to make your space more inspired. We were also excited that the magazine chose to photograph a fabulous custom home LGA Studios designed in the Broadmoor Bluffs area to feature in the pages of the article, a stunning contemporary home that was a joy to design. “The beauty of Colorado inspires design; the homes we create shape our lives,” Larry Gilland says. Natural materials, forms, and light blend to root this Broadmoor Bluffs home to its natural environment and give it warmth. SPRINGS MAGAZINE: HOW HAVE YOU SEEN ARCHITECTURE CHANGE IN COLORADO SPRINGS DURING YOUR 35-YEAR CAREER? Larry Gilland: When I first started in the industry, there was a demand for more rapid suburban growth. We’re now seeing a shift away from the suburbs back into the city centers and older neighborhoods, and many people—from Boomers to Millennials—are looking for homes that fit that engaged lifestyle. The homes may be smaller, but they are low maintenance, energy efficient, and connected to the community. There was some interest in solar homes when I first started, and I’ve been happy to see that interest in green building grow and become more prevalent as we develop new strategies and material innovations to make our homes more environmentally friendly. SM: WHAT ARCHITECTURAL TIPS AND TRICKS CAN HOMEOWNERS USE? LG: Websites like Houzz and Pinterest are great visual tools to help each client communicate their ideas into images. In our business of design, a picture communicates a thousand words. Take the time to find the style—or combination of styles—that speaks to you, whether that be Craftsman, Contemporary, Modern Farmhouse, or French Country. Your home should feel authentic to who you are. SM: WHAT NOTEWORTHY TRENDS ARE YOU SEEING NOW? LG: We live in such a stunning state, so integrating the natural beauty of Colorado is always going to be on trend here. Currently, we’re seeing an increasing interest in modern and contemporary architectural styles, both locally and across the country. We enjoy putting our own Colorado Contemporary spin on that—using organic lines and local, natural materials, paired with plenty of glass to bring in the sunlight and Rocky Mountain views. Lifestyle drives trends as well—right now we’re working with quite a few Boomers looking toward slowing down or retirement, many of whom want to transition to smaller one-level homes where they can age in place seamlessly. Many new buyers also love the older central neighborhoods, where they can add an accessory dwelling unit or a “granny flat” over the garage, giving them space for guests, aging parents, or to rent out on Airbnb. Windows and expansive glass were a major focus in designing this contemporary custom home. Gilland makes sure to spend time considering how to best situate each home on the chosen lot to both preserve native flora and take advantage of the views specific to each site. SM: ANY DESIGN TIPS FOR SMALL SPACES? LG: Look for ways to make the space feel twice as large. Use windows and mirrors to draw in the outside while expanding the visual space. Open the area by using half-walls, or openings to adjacent spaces. Raise the ceilings in proportion to the space and add clerestory or upper windows to expand the visual eye. SM: WHAT DESIGN ELEMENT CAN BE INCORPORATED BY MOST ANYONE TO MAKE A MORE DYNAMIC LIVING SPACE? LG: Always look for ways to bring as much flow and openness as you can. 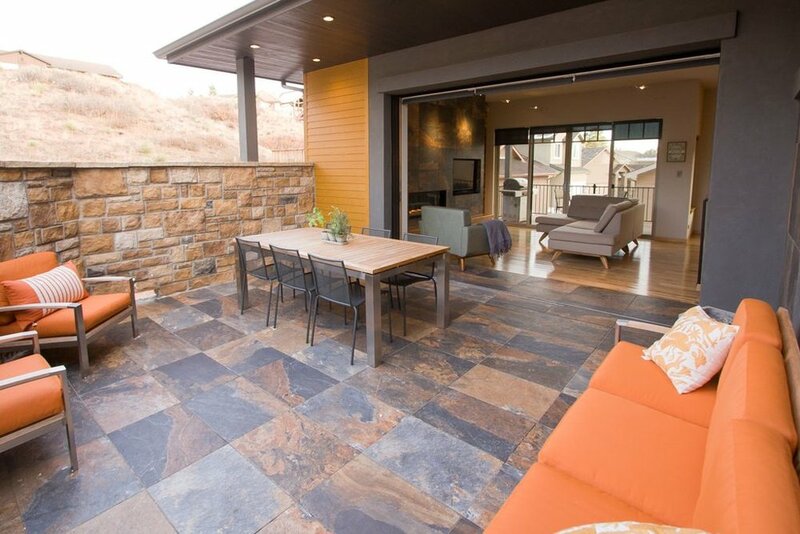 A great way to do that is to incorporate outdoor living space if you are able to. A patio that can be an extension of your family room for entertaining, a courtyard that can used for evening meals, a tiny deck with a single chair for reading, even a window that you turn into a focal point with your room arrangement. You can check out the rest of the interviews with local experts including Doug Osinski with Picasso Homes, Matt Hiner with Hiner Landscapes, and Robin Paisley with Robin Paisley Designs in the Spring issue of SPRINGS Magazine. SPRINGS Magazine celebrates the people, places, and culture of Colorado Springs. Be sure to subscribe to stay in the know about the latest restaurant and brewery openings, the hottest art shows, and the coolest trails. These specifications come from Colorado Springs’s Appendix K, summarized expertly in Ted Cushman’s article “Living with Wildfire” in the September 2017 issue of The Journal of Light Construction. Larry Gilland worked extensively with many homeowners who lost their homes in Mountain Shadows and Black Forest, designing homes that are up to the new code. One of the home building contractors LGA Studios works with is Andy Stauffer, who was interviewed in the article. For more about the homes that were rebuilt after the fires, check out some of our featured projects: Kissing Camels Contemporary, Colorado Springs Rising, and a LEED Platinum Certified Home in Mountain Shadows. Andy Stauffer's website also features some great personal stories of the rebuilding process following the wildfires. 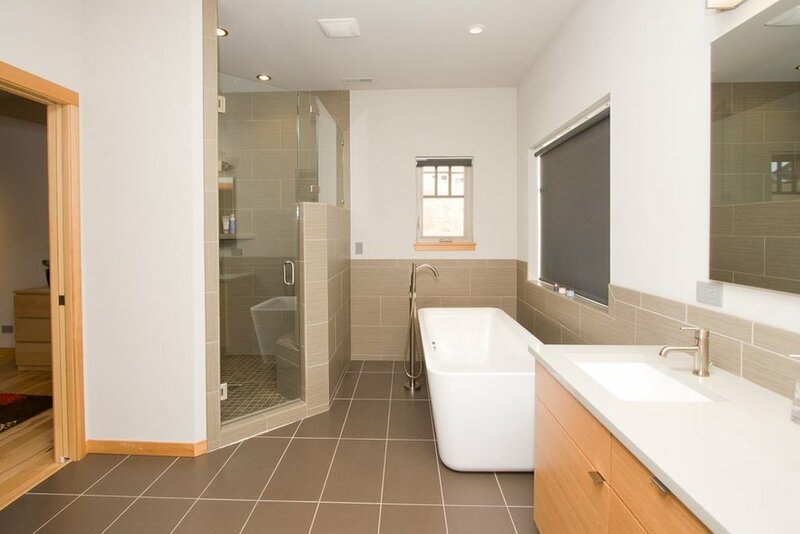 LGA Studios could not be more proud to be part of the project featured in this post: a stunning modern home in Mountain Shadows that was just awarded LEED Platinum certification from the U.S. Green Building Council (USGBC). The LEED (Leadership in Energy and Environmental Design) rating system, developed by USGBC, is the foremost program for buildings, homes, and communities that are designed, constructed, maintained, and operated for improved environmental and human health performance. A home can achieve LEED certification under the LEED homes program after undergoing a technically rigorous process, including the incorporation of green strategies to achieve efficiency and healthy indoor environments. The sound design and operation of the home is tested and measured using tools like a home energy (HERS) rating and onsite inspections. LEED is the foremost program for the design, construction, and operation of green buildings, and this project joins the 121,900+ certified LEED for Homes residential units across 165 countries and territories. Sustainable design has long been a passion for us at LGA Studios, with several of our associates going through the additional training to become LEED Accredited Professionals, and it is a hallmark of our business to continually educate ourselves and our clients so that we can design homes that are both beautiful and efficient. In order for a residential project to be LEED-certified, it must meet or exceed rigorous standards in a variety of categories, from Water Efficiency and Energy & Atmosphere, to Sustainable Sites and Innovation in Design. Projects are scored based on a point system and must be monitored and inspected at every stage. This home is Platinum certified—the highest possible level—meaning it had to score between 90-136 points. Phil Drotar of EnergyLogic was the Green Rater for this home, and he was instrumental in bringing new ideas and streamlining the process. Our client for this project, Damon Winters, knew he wanted to pursue LEED-certification from the start. As the owner of Winters Electric, Damon brought a tremendous amount of his own expertise on energy efficiency, and he knew he would be able to accrue points using innovative options like solar energy and a thoughtful mechanical design. Damon pulled triple duty on this project, serving as the homeowner, contractor, and electrician. This meant shouldering much of the responsibility for installing efficient wiring and maintaining the integrity of the construction site, all the way down to his vigilant monitoring of the waste bins to make sure nothing that could be recycled was going to the landfill. Smaller homes score better points on the certification scale, as they require fewer resources. This project is a bit larger and more spacious, making it more of a challenge, but it made up for that in many other ways. This home was built on a site in the Parkside neighborhood of Mountain Shadows where the previous home had been destroyed in the Waldo Canyon fire of 2012. This allowed us to score a few points in the Sustainable Sites category, as it was a smaller lot in a higher density area, and also because it was an existing infrastructure site. The site was not as favorable from a connectibility standpoint, however, as there are not as many walkable community amenities in that area. Meeting the standards required for LEED-certification can be complex, but often in the most rewarding way. Because the standards are so strenuous and stretch across a project from beginning to end, the process works best when the entire team can collaborate and work together. This means sitting down with the owner, the architect, the contractor, the project manager, the HVAC and landscaping designers, the LEED certification team, etc. and coming up with ways to solve problems creatively and push for responsible and innovative solutions at every level. In August, most of our team — Larry Gilland, Mary Gilland, Dawn Streb, Michelle Williams, Levi Regalado, and Abby Smith — attended the annual AIBD (American Institute of Building Design) Summer Conference that was held in Denver this year. We all attended informative sessions from “Showing your Work in a Better Light”, to an Art Sketching workshop by Mike Lin, to “The Business of Design – Contracts and Corporate Structure”, to “60 Design Ideas in 60 Minutes”. Michael Brightman conducted a session using Sketch-up, and our own colleague Ben Tabolt of CDG Project Studio presented a session on using 3-d BIM software for residential design. On Saturday night at the American Residential Design Awards dinner at the Governor’s residence, Larry was honored to be inducted into AIBD’s College of Fellows, the highest honor for the organization, which he has been a member of for several years. It was a pleasure having our great team of people attend this with us. As I signed the necessary papers to enter into the Interior Design program in college, I had no clear picture in my head of the future I was about to create for myself. Was I going to be choosing paint colors for the rest of my career, measuring rooms to fit the largest sofa, or collaborating with architects to create floor plans? Up to this point, I hadn’t even considered the role marketing and visual graphics play in the architectural realm. As I finished my degree and entered into an engineering firm and later an architectural firm, I have carried with me the realization that design cannot exist without a visual impact. Isn’t this exactly what we do as designers? We communicate through design: we listen as a client verbally communicates their vision and it is our job to bring that vision to life. After a proposed building design is drawn and printed, the next step is to then present these lines on paper to the client. As the designer, we need to be able to present our designs well – allow the client to understand what the proposed building will look like, what it will feel like, and how it will impact their life. 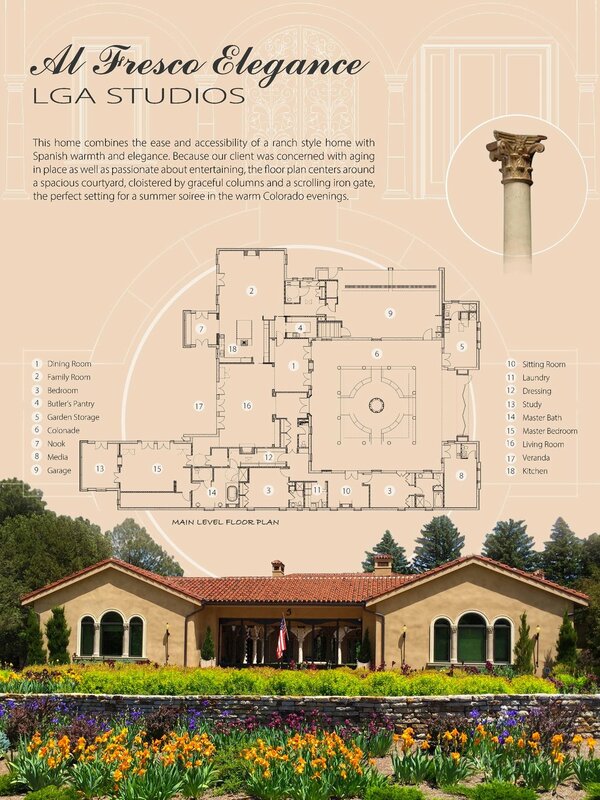 Most of the time, staring at a floor plan will not generate this understanding for a client. They need more, they need a visual impact. In order to create this impact, we need to dig a little into some visual marketing concepts and ideas. There is a relationship between an object (in this case a proposed building plan), the context it is placed in, and its relevant image. This is the focus of a design board. A design board encompasses how images and text can be used to communicate a design concept. The concept and its visual communication become linked and inseparable. This newly formed grouped concept is what reaches out to people and defines their choices. These boards are a means to turn concepts and intangible things into something more concrete for the client. Laying out a design board can be a daunting task. Sifting through each component of a project and deciding what to include can be the most difficult part. It helps to imagine that I am viewing a project for the first time. What do I need to see in order to understand it? What am I trying to convey? What are my key elements in the design? Some basics to include are floor plans, elevations, perspective renderings, and text describing the project. Once I have collected the information, it’s easier to visualize what will be on the board. I can then start planning the structure. Consider using a grid to help organize the visual elements on the board. This can be a simple or more complex grid system. As images are being arranged and sized, I make sure to keep some elements viewable from a distance and some viewable up close. This helps to create hierarchy. Keeping the font and font sizes readable is also important. Photoshop or InDesign are great layout programs; however, if I am short on time, Microsoft Word or PowerPoint can still be useful. These two in-process design boards help to show a few differences in the layout construction of a board. In board 1, the rendered image of the townhouse is the focal point of the page. The photo especially stands out and can be seen from a distance; however, all other information pales in comparison to the photo. This board would work well for a client who is more interested in seeing the general idea of the proposed townhome and less interested in seeing the specifics of the floor plan or details. In board 2, the rendered photograph is no longer the focal point of the board, but shares size ratios with the elevation and floor plans of each floor level. This board would work well for a client is more interested in the specifics of the project. We as designers have a gift of visionary creativity. We can see and visualize abstract thoughts and ideas in a way not everyone else is able to. Using mediums like design boards enable us to communicate our ideas and visions to the client in an effective and impactful way.